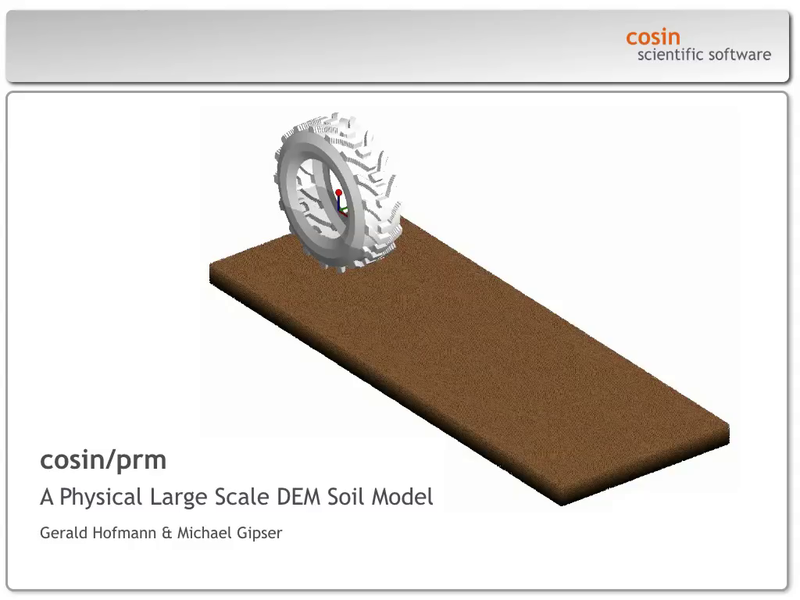 cosin/prm is a new approach for flexible soil and „rigid body to soil“ application in vehicle simulation. cosin/prm goes beyond the limits of current Bekker/Wong based soft soil modeling and provides full deformable and displaceable soil and not only a vertical degree of freedom added to surface nodes. Similar to FTire’s approach compared to FE tire models, cosin/prm makes a meaningful simplification to the soil’s actual physical properties and creates a particle based soil system, that shows comparable properties in the target application range, without going into details of actual microscopic soil elements. cosin/prm is not meant to be a tool for terra mechanical investigations. cosin/prm is designed to execute on standard desktop computers in an „MBD timescale“ (hours to days, and not months like FE based soil models). cosin/prm is parameterized from physical testing of relevant soil properties, while not re-creating actual soil particle shapes or molecular forces. cosin/prm currently is under development and not yet product ready.